Now, in a sign of the times, as the naval aviation community looks to a future carrier air wing with the Super Hornet serving alongside the F-35C Joint Strike Fighter, the last operational legacy squadron will finally begin its transition from the one-seater F/A-18C to the F/A-18E. 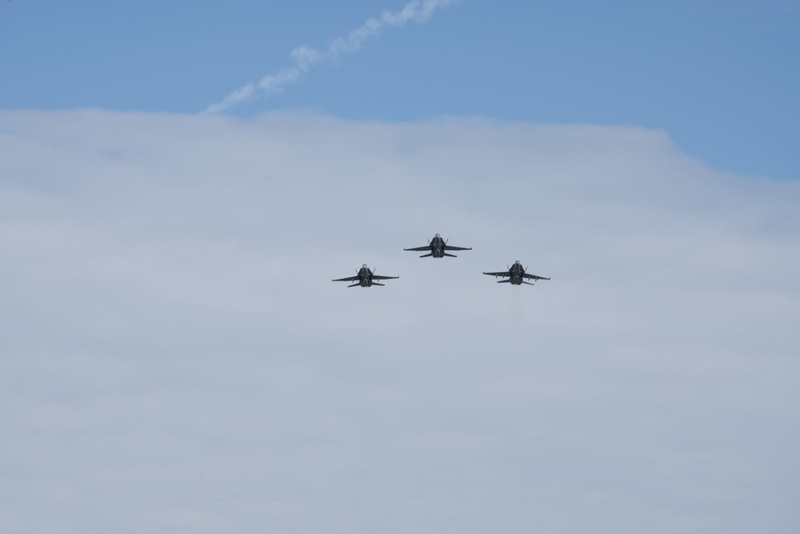 Pilots from Strike Fighter Squadron (VFA) 34 fly the F/A-18 Hornet in a three-man formation over Naval Air Station Oceana for the final time. The F/A-18 Hornet entered operational service for the fleet in 1984. 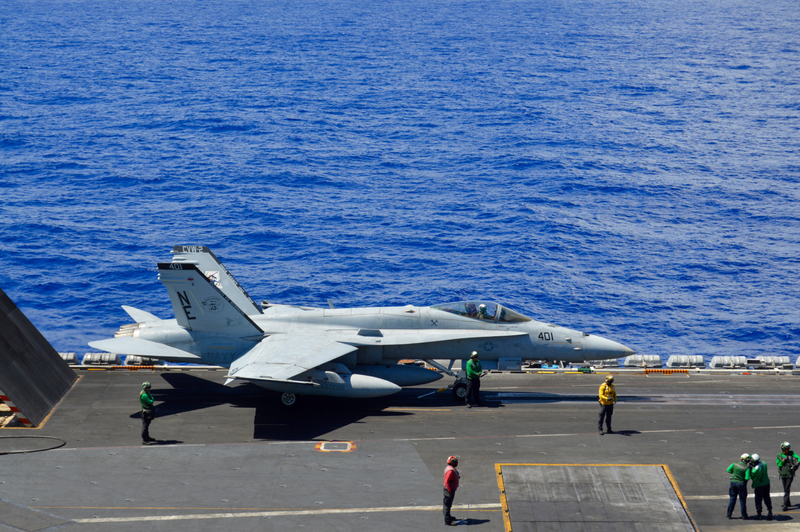 The aircraft’s first combat mission was in 1986 during Operation El Dorado Canyon and the legacy Hornet continued to serve in every major U.S. military operation including the Gulf War, Iraqi War, Enduring Freedom, Iraqi Freedom, Inherent Resolve and most recently served in 2018 from the deck of USS Carl Vinson (CVN 70) with Strike Fighter Squadron (VFA) 34 while conducting freedom of navigation patrols in the South China Sea. US Navy photo. VFA-34 was deemed in 2016 to be the squadron that would conduct the last legacy Hornet operational deployment – and it was certainly a busy deployment cycle for the squadron. Along with the rest of Carrier Air Wing 2 embarked aboard USS Carl Vinson (CVN-70), the squadron left San Diego in January 2017 for the Western Pacific, and the deployment was extended by a month so that Vinson and other Navy ships could sit off the Korean Peninsula during an especially tense time in U.S./North Korean relations. Vinson again deployed in January 2018 for a few months, which included a historic port call in Vietnam; the carrier returned home to San Diego for a few months and then headed west again for the Rim of the Pacific 2018 (RIMPAC) exercise in Hawaii. Frattin, who had only flown the Hornet and not the larger and newer Super Hornet, spoke fondly of his plane but admitted that the Hornets “probably require a little more TLC” in recent years. 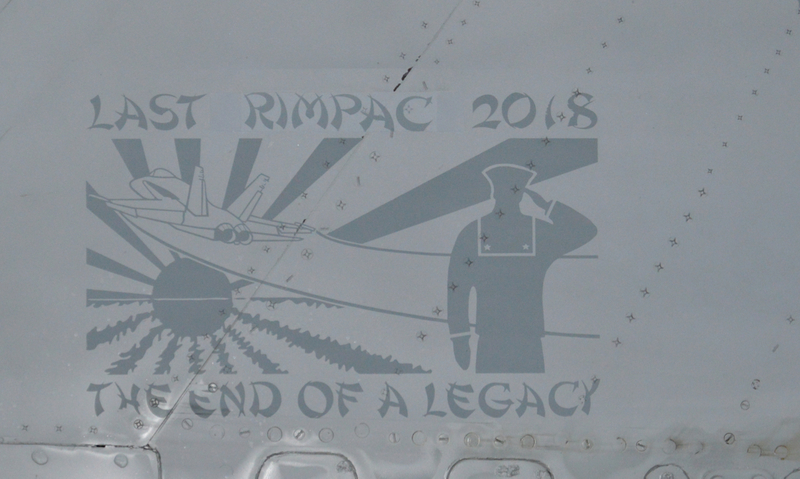 Maintainers from VFA 34 designed a logo to paint on the legacy Hornets to acknowledge the platform’s last major event on the international stage ahead of the final legacy squadron’s transition from the Hornet to the Super Hornet. USNI News photo. He said during deployments on Vinson, there might be more Hornets up on jacks than Super Hornets because the older planes had started popping hard landing codes frequently during carrier landings. While the pilots tried to be gentle with the planes, he said, landing on the carrier deck during rougher seas almost certainly set off that code. That being said, Frattin added that the Navy had certain missions it only used the Hornet for, due to weapons loadout testing that had been conducted with the Hornet but never repeated on the Super Hornet. “We have some unique capabilities that, I’m wondering who’s going to pick up the slack when we’re not here anymore, because for some things we do we’re the only ones who can do it,” he said. He added that he had been told the Hornet is a little nimbler and more agile than the larger Super Hornet, and while it won’t win a race straight off the flight line the legacy plane will eventually reach a higher top speed than its newer counterpart. The CAG Bird from VFA 34 sits in the hangar on USS Carl Vinson (CVN-70) during the Rim of the Pacific 2018 exercise in Hawaii. 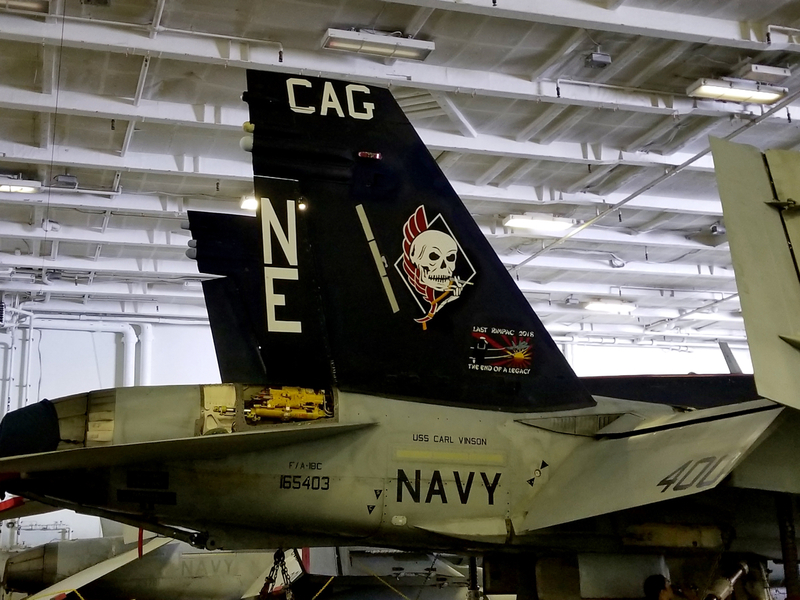 The squadron painted the Hornets to commemorate their last major event before the platform leaves the active Navy’s operational service. USNI News photo. Frattin praised the Navy’s handling of the transition, saying that “really they gave us the funding, the parts, the jets that we needed – we got the pick of the litter” as other squadrons began their transition to the Super Hornet. He said he thought his squadron had accepted and transferred out more aircraft than any other squadron while he was in it, as the pilots and maintainers were able to be choosy about which airframes they liked working with and which ones they wanted to discard. VFA-34 is set to get new F/A-18E jets coming from Boeing’s manufacturing line in St. Louis, Frattin told USNI News last summer. Maintainers from the squadron were set to start at schools in late 2018 to get proficient in maintaining a new aircraft type. Now that the sundown ceremony has taken place, the pilots will go through a 10-hour syllabus to get NATOPS certified on the bigger planes, Frattin said, and the squadron will have to conduct its Super Hornet flight and maintenance training in coordination with the nearby fleet replacement squadron until the Navy declares VFA-34 safe for flight. Once that declaration is made, the squadron can resume independent operations on its own flight line. Though the Hornet is now out of the Navy’s operational fleet, reserve units such as Fighter Squadron Composite (VFC) 12 will continue to use the Hornet as aggressor aircraft in training events. The Marine Corps will also use the Hornet until 2030, when it replaces all its fighter squadrons with the F-35B Joint Strike Fighter.